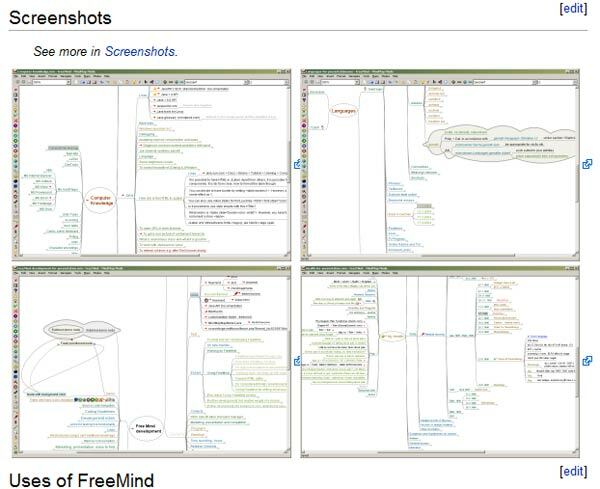 FreeMind is a premier free mind-mapping (http://en.wikipedia.org/wiki/Mind_map) software written in Java. The recent development has hopefully turned it into high productivity tool. We are proud that the operation and navigation of FreeMind is faster than that of MindManager because of one-click “fold / unfold” and “follow link” operations. Curio is another application that looks like it was designed for the OS X platform, with a fairly advanced interface allowing several complex features. These include in-built searching of popular image website, encryption, a “dossier” screen to help track the requirements of a project, and a full-screen presentation mode. 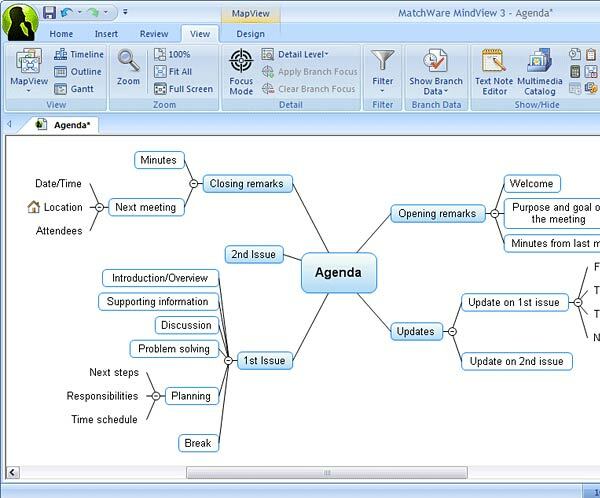 MatchWare’s MindView 3 Business is a professional Mind Mapping® software application that allows users to brainstorm and visualize ideas quickly and easily. MindView 3 Business makes meetings more productive, accelerates project planning and helps turn ideas into action faster than ever before! 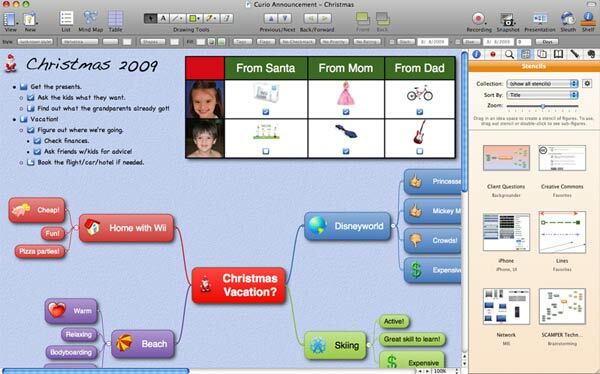 MyThoughts for Mac Creates Fluid, Organic, Curvy Mind Maps that work in a way that the human brain enjoys! If you illustrate something with straight lines, rigid boxes and lists the human brain is snoring in no time at all. But, given shape, curves, images and color the human brain loves it and drinks it all in. So, why would you want a Mind Map that has straight branch lines, rigid templates and inflexible layouts? MyThoughts for Mac introduces a new level of freedom in the use of Mind Mapping Software allowing you to create Unique, Flowing, Brain Friendly Mind Maps. 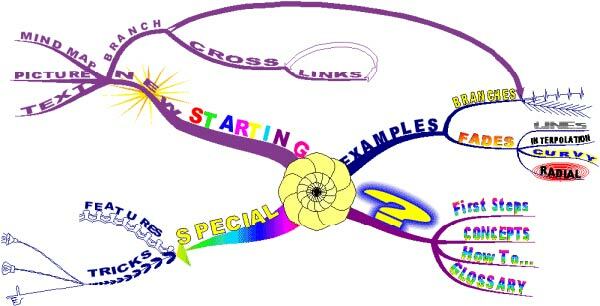 iMindMap is a creative and very easy to use tool that is available in three Editions. 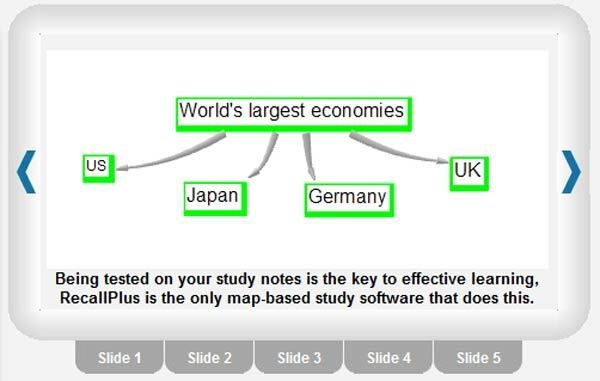 It is the only software that accurately delivers the visual flexibility and brain friendliness of the highly proven and renown Buzan Mind Mapping techniques. 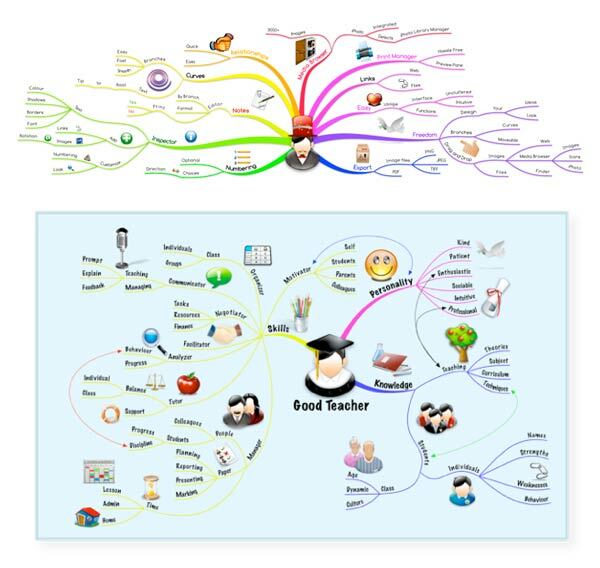 iMindMap allows you to organise, create, innovate, plan, present, notate, learn, structure, communicate, problem solve and project manage all in one place. Are you a teacher looking to present your lesson plans? Are you a business owner who wants to get the word out about your product or service? Are you a speaker who wants your information to reach people who could not make it to your seminar? 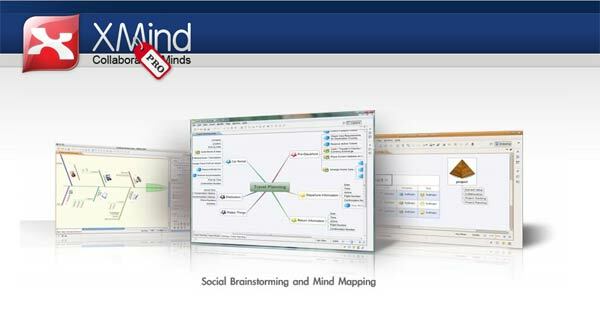 XMind Pro makes it easier to express your ideas and share your information using its Presentation function. 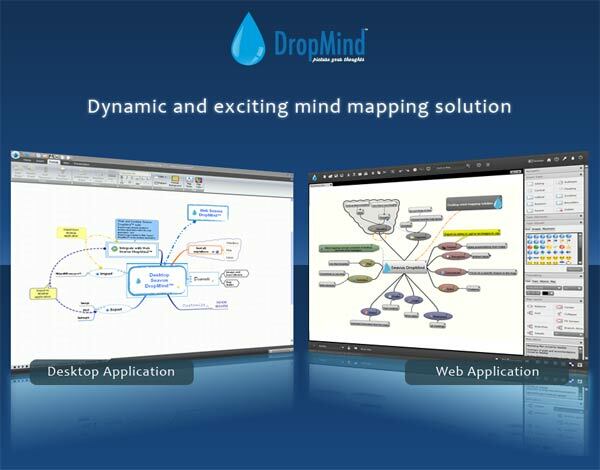 Launch your XMind Pro, where you can draw a mind map or open existed maps. One click enters you into Presentation mode, where your map will be shown on the full screen. You can just use the navigation toolbar within Presentation mode or Spacebar, Enter, Tab, or Arrow keys to navigate through topics. Every time a new topic is selected, it will be highlighted and positioned in the center of screen so your audience can concentrate on it. The powerful way to visually organize your information and keep your work moving forward. 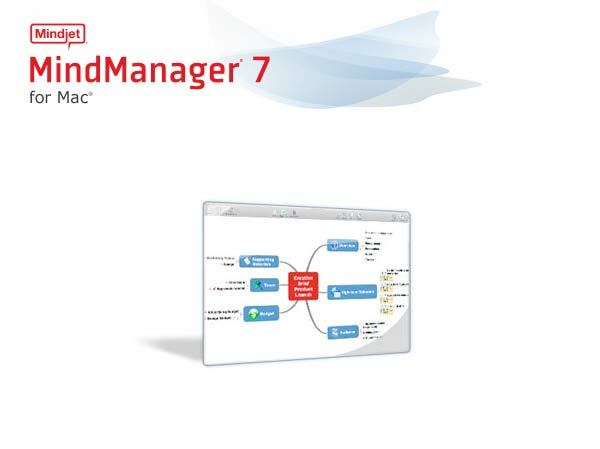 MindManager 7 for Mac is a visual productivity tool that enables you to organize, manage, and communicate ideas and information to solve problems, drive innovation, and make consistent progress toward your goals. 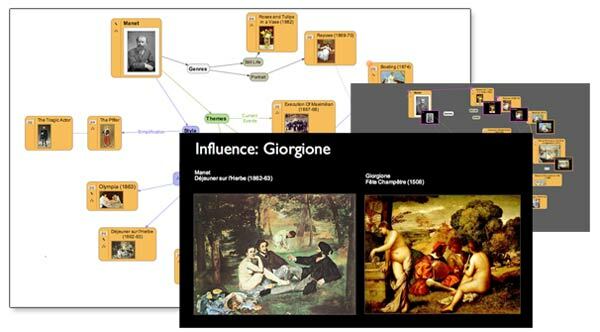 Use it to create interactive diagrams called mind maps that start with a central theme, then add branches with different ideas, notes, images, tasks—even hyperlinks and attachments. You’ll have all the information you need at your fingertips without being overwhelmed, so you can see the big picture as well as the details. 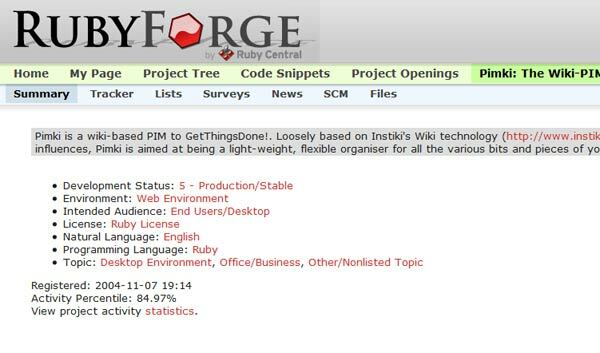 Pimki is a PIM (Personal Information Manager) loosely based on Instiki‘s Wiki technology. This is the place to dump your brain, organise your thoughts and Get Things Done. The ease of use and immediacy of a wiki combined with extended view to slice and dice the data give you a unique power to store, manage and retrieve all loose bit of information in your life. 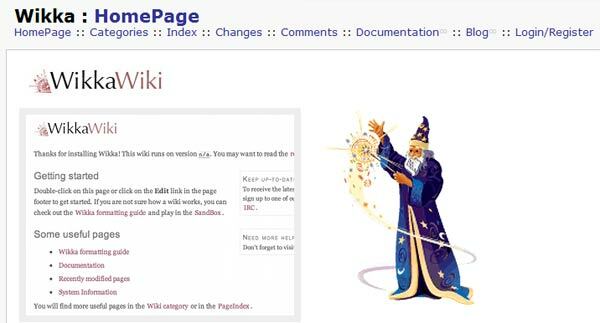 There are a lot of features added over a regular Wiki, features that only make sense when you view it as a personal application and not so much as a group oriented application. See below for a full list of goodies. Please feel free to try it to organize your thoughts. Email me if you have any problems (assaph at gmail) or submit bugs / feature requests on the RubyForge project page. 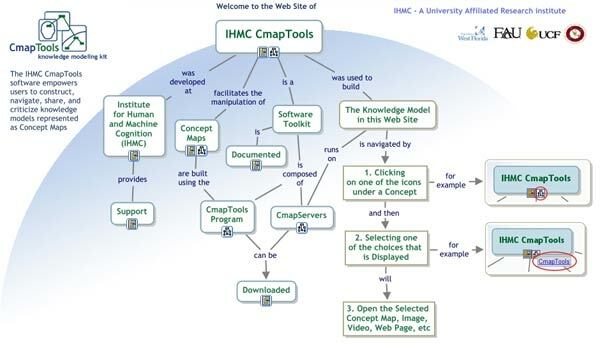 The IHMC CmapTools software empowers users to construct, navigate, share, and criticize knowledge models represented an Concept Maps. 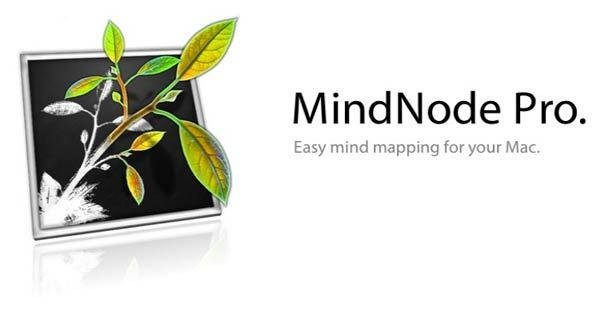 Mindomo is another online mind mapping software program that features a simple, streamlined interface. RecallPlus is software designed specifically for students who want to learn faster and improve their marks. RecallPlus goes beyond simple note-taking and organizing – it actually tests students on their notes so they can learn the information. RecallPlus is the only true study software because it is the only software that combines concept mapping of notes with testing. DeepaMehta is a software platform for Knowledge Management. Knowledge is represented in a semantic network and is handled collaboratively. DeepaMehta combines interdisciplinary research with the idea of Open Source to generate a true benefit for workflow as well as for social processes. At the same time Deepa Mehta is an indian movie director. The DeepaMehta user interface is build according to research in Cognitive Psychology and accomodates the knowledge building process of the individual. 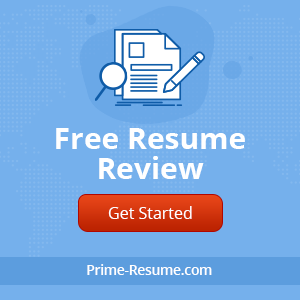 Instead of handling information through applications, windows and files with DeepaMehta the user handles all kind of information directly and individually. 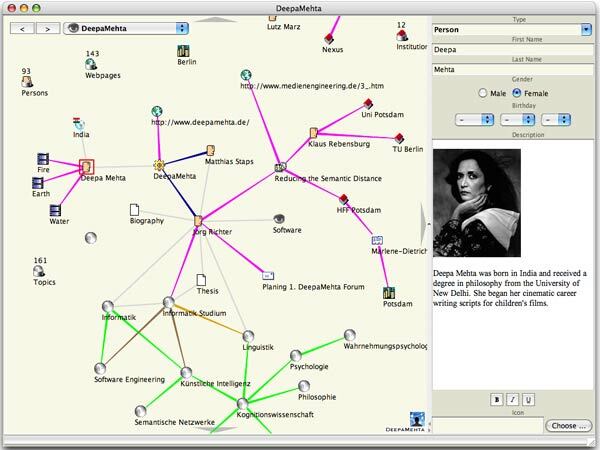 DeepaMehtas user interface is completely based on Mind Maps / Concept Maps. 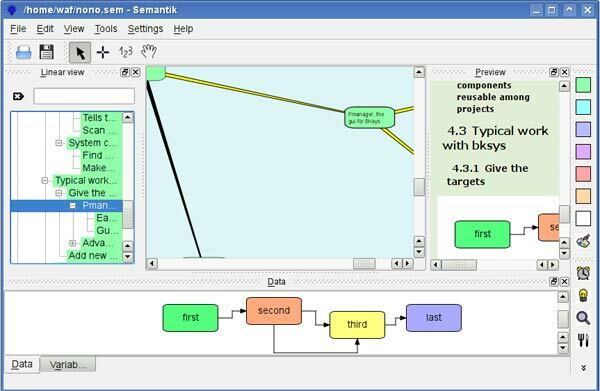 Semantik is a mind mapping tool designed for students who need help with essays and other papers. 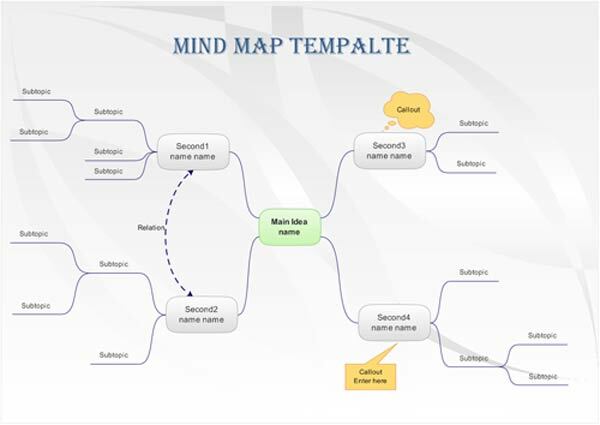 A mind-map is a diagram used to represent words, ideas, tasks or other items linked to and arranged radially around a central key word or idea. It is used to generate, visualise, structure and classify ideas, and as an aid in study, organisation, problem solving, and decision making. VYM is a thinking and planning tool that helps students and other users with time management, creativity, organization, and other skills. MindRaider is a personal notebook and organizer that lets you use clips from the web, your files, and your brain to stay organized. Looking at the creative problem solving framework through a new set of digital tools. (“Toward a Digitally Driven Process”, 19:25 min) Video produced by Diego Uribe, International Center for Studies in Creativity at Buffalo State College. 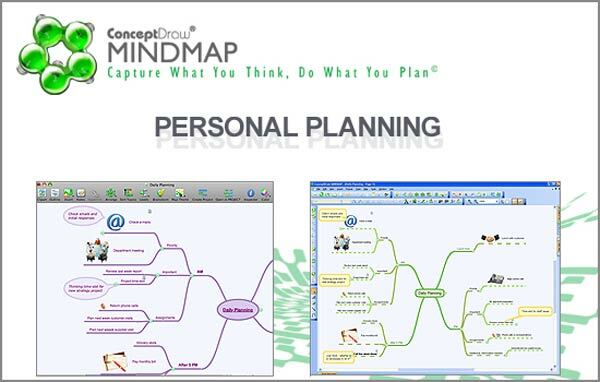 Individual Get creating and sharing mind maps online with our unlimited Premium account. Access your maps anytime and from anywhere and brainstorm with friends and colleagues in real time, just using a web browser. 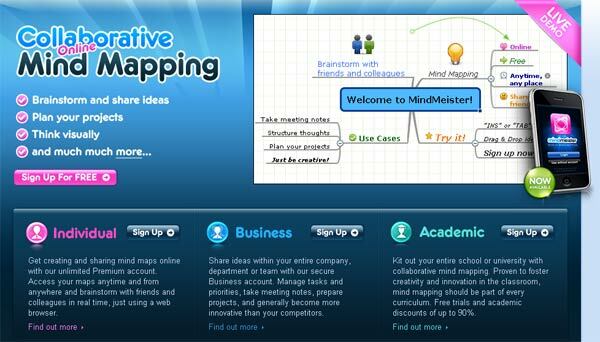 Business Get creating and sharing mind maps online with our unlimited Premium account. Access your maps anytime and from anywhere and brainstorm with friends and colleagues in real time, just using a web browser. 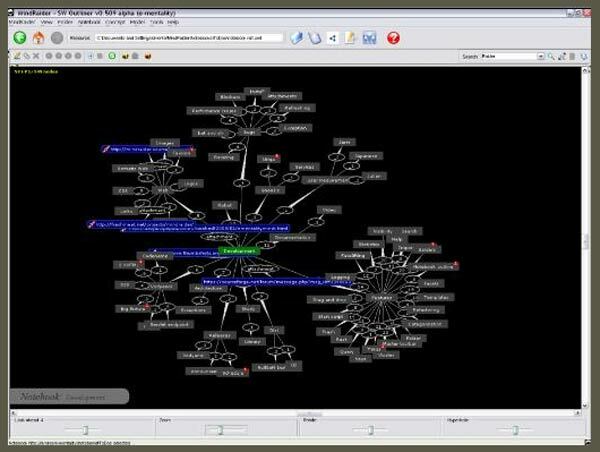 Wise Mapping is the web mind mapping tool that leverages the power of Mind Maps mixing new technologies like vectorial languages (SVG and VML) and the power of the whole Web 2.0 concept. No pluggin required. 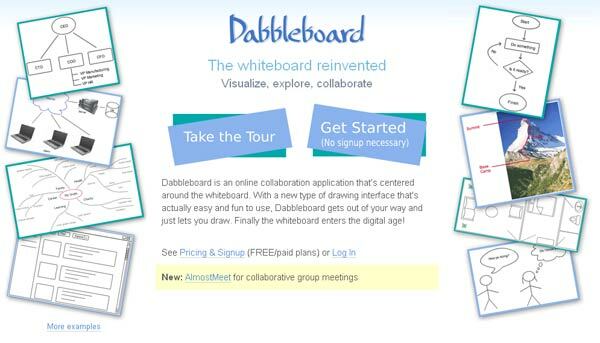 Choose to use a desktop or web-based version of DropMind for real-time collaboration or the ability to add hyperlinks and images. Mindjet is expensive, but when you use the online version to work with friends, you can split the cost. Comapping is online software to manage and share information. Use it to take notes, plan and organize. It’s a way to have one set of notes. One set of files. For everyone. 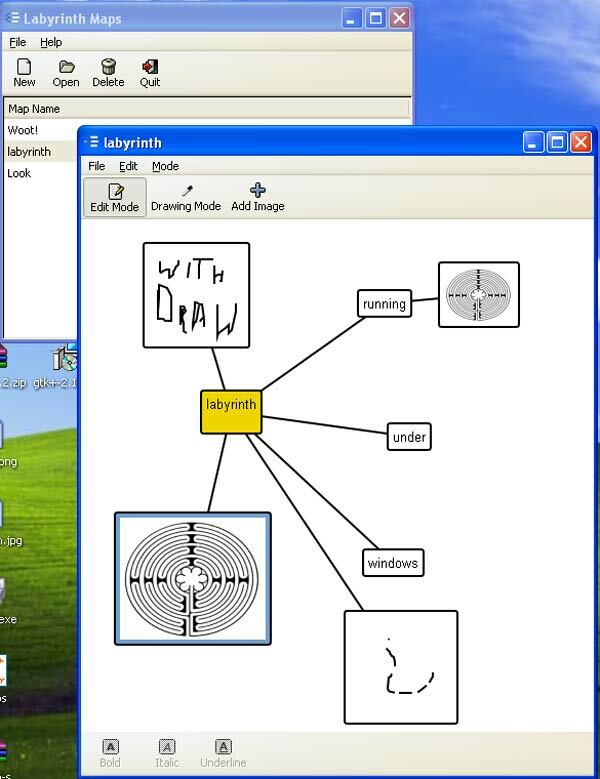 This artistic, flowing mind map lets you import text from the web and Microsoft Office. Works on Windows only. Use the content you’ve gathered to build elaborate visual hierarchies. Add annotation. Link to external web pages and desktop documents. Easily mastered, surprisingly powerful. 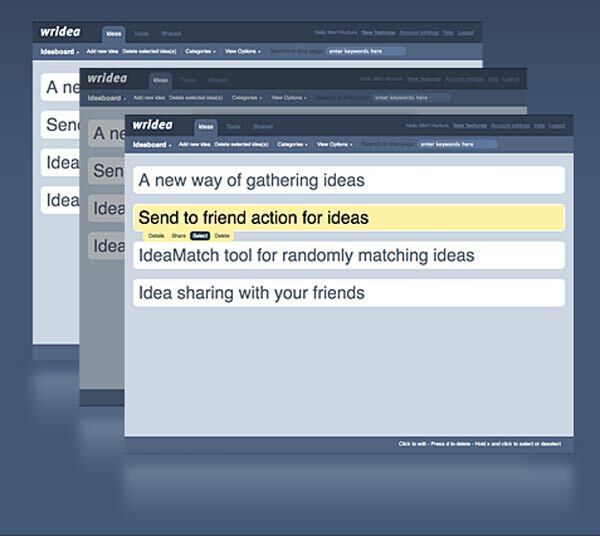 With eminec MYmap, you can use your computer to brainstorm, organize and share ideas. The program supports you along the entire way from collecting ideas to structuring your thoughts and presenting them. eminec MYmap enhances your existing office software with all the tools you need to unleash your creativity in a productive way. The result: With eminec MYmap, you’re going to have fun and save time. 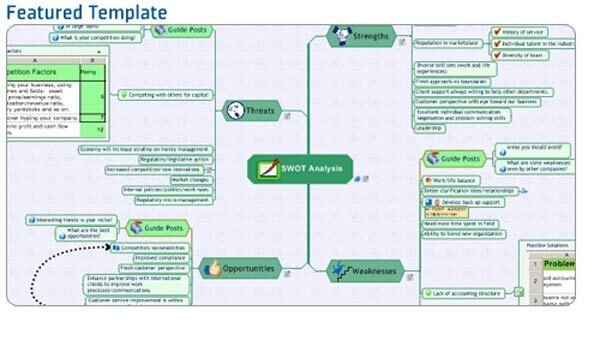 Perfect vector-based mind mapping software with abundant examples and templates! Edraw is the quick and easy map mapping software for creating great-looking mind maps (graphical representations of thought processes) for brainstorming, problem solving, rational analysis, and decision marking. It includes thousands of ready-made graphics that you simply stamp to create your drawing. You don’t include the excellent NovaMind in this list…. 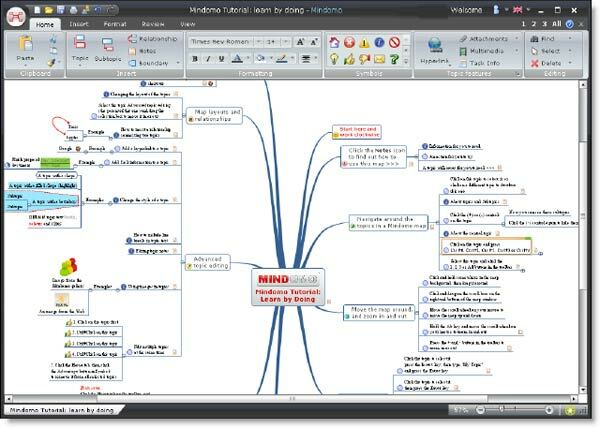 I had no idea that there were so many mind mapping options out there. I’m surprised that some of them even charge money with all the competition. 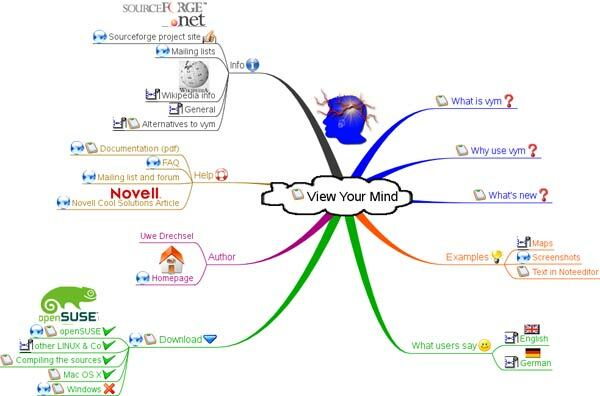 WoW Awesome collection of mind mapping application. I was searching this type of collections . Really great . Thanks for sharing this awesome post. I would also add to this list, the Personal Brain from http://www.thebrain.com . xmind is great because it’s *so* easy to share or publish your mind maps, just one click to post the current version of your mind map to your xmind feed. You build a feed of your maps as they evolve over time similar to a twitter feed. Also has cute icons that let you use the mind map to track the progress of projects over time or mark items in various ways. Plus it’s free and open source! 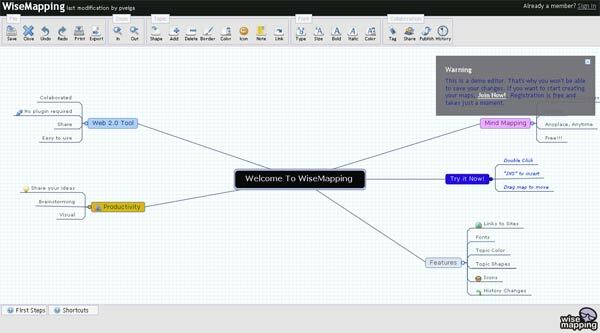 We welcome your comments and feedback from any mind mapping software users. helpful applications thanks for share.. Very nice sharing, thank you. I am using mind maps for managing my daily taks and study notes. I was useing one of the (above mentioned) mind mapping application since a year back.